National Right To Life has misled the pro-life community to think that this is the wrong time to advocate personhood because we need one more Justice on the Supreme Court to have a pro-life majority. But if we added a Justice who would uphold the right to life of the unborn, then we would have only one such Justice. The failed long-term strategy of regulating the killing of children has left America without a single Justice who knows that it's wrong to kill an unborn baby; National RTL's compromise will never produce a pro-life Supreme Court." Even Dr. James Dobson, a supporter of the failed regulation strategy admits that: "Ending partial-birth abortion... does not save a single human life." 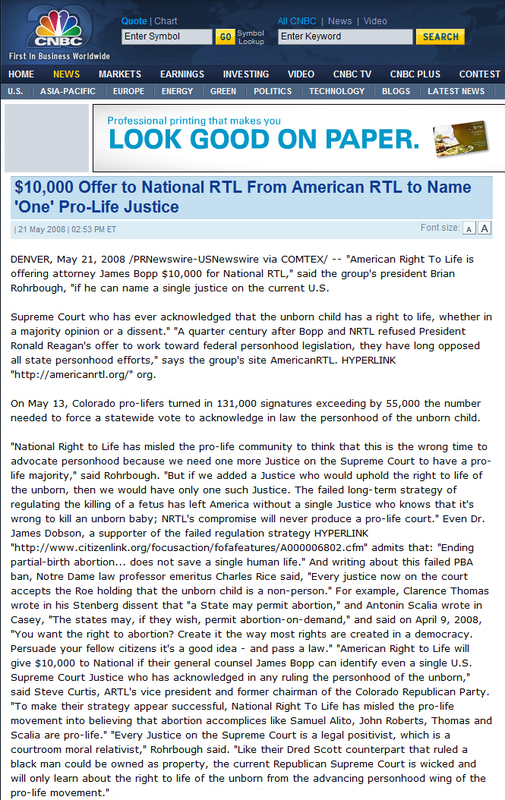 And in an article about NRTL's failed PBA ban, Notre Dame Law School's professor emeritus Charles Rice said, "Every justice now on the court accepts the Roe holding that the unborn child is a non-person... The situation remains as described by Justice John Paul Stevens in Planned Parenthood v. Casey." For Stevens had written that "the Court... rejected, the argument ‘that the fetus is a "person"'. ... there was no dissent..." And Clarence Thomas wrote in his Stenberg dissent that "a State may permit abortion," and Antonin Scalia wrote in Casey, "The states may, if they wish, permit abortion-on-demand..."
"American Right to Life will give a $10,000 cash prize to National if their general counsel James Bopp can name even a single U.S. Supreme Court Justice who has ever written or joined in any ruling or dissent advocating the personhood of the unborn," said Steve Curtis, ARTL's vice president and former chairman of the Colorado Republican Party. "To make their strategy appear successful, National Right To Life has misled the pro-life movement into believing that abortion accomplices like Samuel Alito, John Roberts, Thomas and Scalia are pro-life." In 2002 Scalia said, "I will... strike down a law that is the opposite of Roe v. Wade. ... One wants no state to be able to prohibit abortion and the other one wants every state to have to prohibit abortion, and they're both wrong..." In 2004 Scalia claimed, "Take the abortion issue... there's something to be said for both sides." And on April 9, 2008 Scalia said, "You want the right to abortion? Create it the way most rights are created in a democracy. Persuade your fellow citizens it's a good idea - and pass a law." And then Scalia even joked about the actual killing of the child by using the phrase, "split the baby," to much laughter, from the students, and from himself. National RTL claims success in Antonin Scalia but Justice Scalia is not pro-life; like all the Republicans on the Court, he is a legal positivist, which is a courtroom moral relativist. Like their Dred Scott counterpart that ruled a black man could be owned as property, the current Republican Supreme Court is wicked and will only learn about the right to life of the unborn from the advancing personhood wing of the pro-life movement.